Home buyers in Templer Park in Selayang, Selangor, are frustrated that they cannot move into their new condominium units even with the keys in hand. The some 240 buyers are still waiting for the developer to connect the water supply and complete the internal fittings in their units in the T-Park Land@Templer Park development. They also claim the developer had prematurely handed over the units on May 16 to avoid playing the late delivery penalty. Chei Chuan Hau, 40, is especially irked at the developer’s failure to connect the water supply. “Water is most important and there is none. The pipes at the main water outlet have yet to be installed,” he told reporters yesterday at T-Park Land@Templer Park. Chei claimed the developer had told them that the water would be connected by the end of June. “When the time came and the water wasn’t connected, we called the developer who gave us the excuse that it was waiting for the water meters. “It has been more than two weeks and we are still waiting,” he said, adding that the contractors had also yet to finish installing the kitchen cabinets and equipment in the units, and there were still gaps in the walls. Chei, who is renting a house in Selayang, said his monthly bills had escalated because of the delay. “I am paying RM1,000 in rent and RM1,750 to service my housing loan. I would not have to rent if my unit were ready,” he said. Chei said that he had sent letters to the developer, the Urban Wellbeing, Housing and Local Government Ministry and the Selayang Municipal Council on July 9, but had yet to receive a reply. “We want the authorities to query how come the architect had approved the Certificate of Completion and Compliance (CCC) and the developer had handed over the keys without fulfilling the Sale and Purchase agreement,” he said, adding that the developer received the CCC on May 28. How Loong Siong, 38, wants to the developer to compensate the buyers for its failure to hand over a fully completed unit. “We want the developer to compensate us for the monthly instalments and maintenance fees that we are paying for an incomplete unit,” he said. 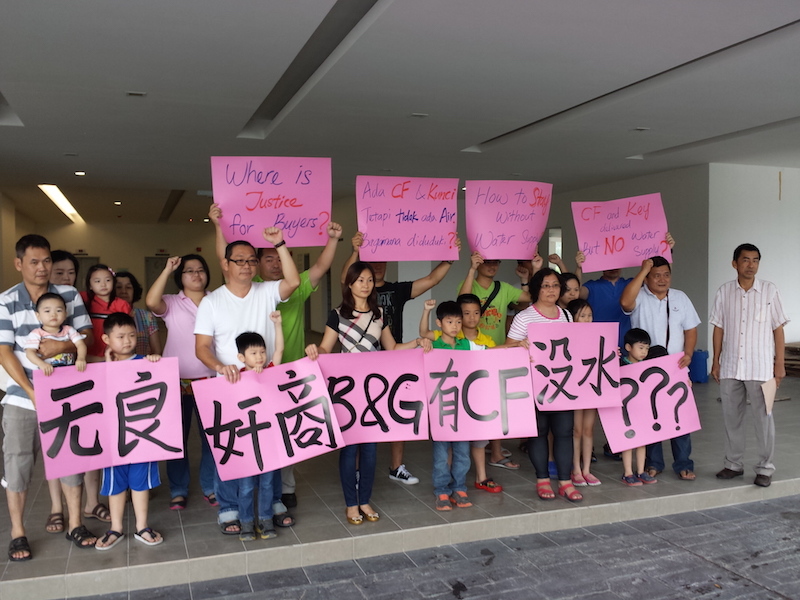 Kepong community centre head Yee Poh Ping urged the authorities to give the matter their immediate attention. “The Board of Architects Malaysia should investigate how the architect approved the CCC,” he said. Yee said he would be writing to urge Urban Wellbeing, Housing and Local Government Minister Datuk Abdul Rahman Dahlan to look into the issue. “We want the minister to call for a meeting with the buyers and the developer to find a solution to their problem,” he said. Calls to the developer went unanswered because its office was closed yesterday. – July 20, 2015.